A new volleyball season is upon us, and I’m sure many of us are heading into our first week back on the court with gusto and optimism. But there’s a lot of pressure on us all to perform at the highest level, so we all want to make sure we show up prepared! 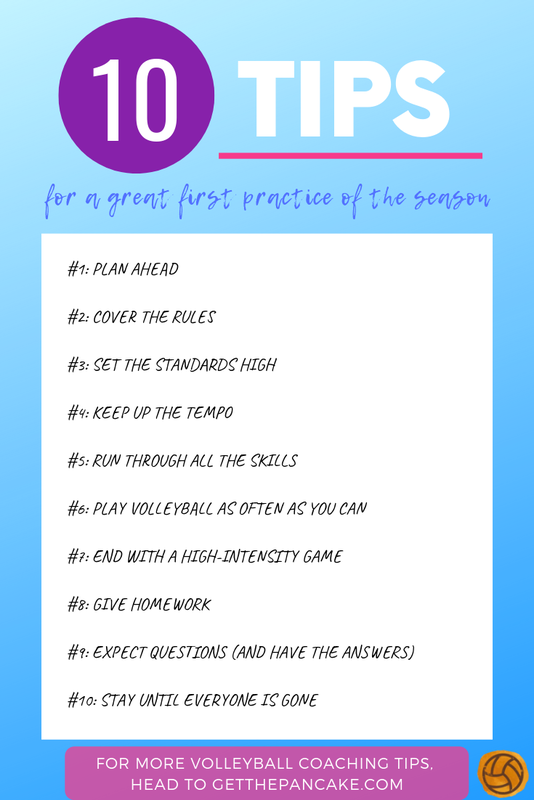 Having gone through the whole “new season” thing QUITE a few times, here are my own personal tips for conducting a GREAT first practice of the year. OK, you’re here, so SO FAR, SO GOOD! But this is worth mentioning, because I’ve seen WAY too many coaches wing the first practice. Having a plan will help you keep on task, teach everything you want to, and generally keep your team progressing at a good rate. Use the remaining tips to complete your plan. If you don’t know the rules, you can’t play the game. This goes for the rules of volleyball, as well as the rules of practice! This is best covered in the beginning of practice (if you haven’t covered them already at a team meeting prior to the season). Don’t want your players kicking the ball? Tell them. No swearing? Tell them that too. You can make your rules as specific or as broad as you want, but I find a couple of specific rules mixed with broad rules (always be respectful towards each other, towards coaches, towards officials, etc) works well. That way, when players act in a way that is detrimental to the team (not looking at coaches when they’re giving instruction, etc), you can enforce the respect rule. Make sure you have consequences as well (I like the consequence of sitting out, personally) so that broken rules do not pass with just a dissatisfied look. You probably expect no walking at practice, right? Not all kids have been on a volleyball team before, and they may not know this. Tell them, and if they’re not hustling all over the court, remind them. You have a leg up for the first week or two, because players don’t necessarily have a role on the team yet and they are competing for a starting position. Therefore, they’ll be more responsive to verbal reminders that they need to shag their ball every time, run AROUND the drill, or even just look at the coach when the coach is speaking. Set your expectations now, because if you laugh and let little things slip, you’ll be fighting an uphill battle the rest of the season. Your motto for the first week: My players WILL go home exhausted. You’ll want to vary your drills so your players get to catch their breath after particularly strenuous drills, but the number of touches on the ball and pace of most drills at your first practice should both be high. If there are any positions which are up for grabs, you’ll get an idea of who the better fit might be for a starting position. You get to TEACH the skills the way you want them performed. I’m pretty particular about most of the skills. I know there are a few ways coaches teach different skills, and I let some players use different techniques if it’s clear it’s working for them, will not hurt them physically in the long term, and will not hurt their future volleyball careers. But for the most part, I want my setters to set a certain way, my servers to serve in a particular manner, etc. You might be surprised that your best setter is actually your middle. Or some other nugget of useful information which passed by you at tryouts is now clear. You may have a plan based on your roster, but once you see how each player performs all the skills, you may change your mind. AND THAT’S OK! Teaching skills is necessary to building the fundamentals for a great volleyball team. But we want to make sure that we are teaching skills in a way which benefits the players the most and gets them ready for the GAME. There is definitely a time for each of these, but let’s try to minimize these, shall we? Instead of tossing a freeball over, toss to a player who passes the ball over. This will help players recognize a freeball is coming, and the trajectory will be more game-like. Your players who are passing the ball over will also be working on ball control. Try to make your drills as game-like as possible, replicating the sport as much as you can. Once you have your practice plan done, go through and see if you can make any tweaks to it to improve in this area. The end of practice is when I like to give my players the chance to PLAY. Minimal coaching, just play time. Of course I’ll offer instructions, tips, MAYBE pause to breakdown something extremely important or clarify something, but I prefer to let little things slide. Players can learn a lot through trial and error, and picking up the pace is only going to increase the chances that they go all out for the ball. If your practice is open to parents, you also want to end this way, because it gives the parents a chance to see how practice is going. They like to watch their kids play, and this is fun for them! By ending with a high intensity game, it gives parents something to talk to their kids about on the ride home. The first team to understand their lineup, to come together as a team, and to understand how to PLAY volleyball, is usually the team who will start winning early on. Have an article you found on team spirit? Print out ten copies and hand them out at practice. You’ll start the next practice with a discussion on the article. Have players who are new to volleyball and are struggling with their approach? Assign everyone 50 approaches a night until the next practice. Not everyone will follow through. Of course you want them to, and you should expect them to, but this is what gives players the opportunity to stand out. Kids crave information and feedback much more than we give them credit for. Give them the opportunity to follow through. The quicker these basics are out of the way, the faster you can get to more advanced strategies and drills. When’s the first tournament? How far away is it? When does the team play? Can they take snacks? How is playing time determined? When will they know the lineup? How did my daughter do? What can she work on at home? This is just the tip of the iceberg. And it doesn’t even matter if this was all covered in an email, a meeting, or in person before. It will all be asked again! But that’s alright! You just need to be ready for it. If there was a packet of information handed out previously, HAVE IT WITH YOU. And a couple of copies, if you can manage. If an email went out from your director a few days again, make sure you READ IT, and have it saved on your phone so you can reference it quickly. Parents will have questions, players will have questions, just be patient and plan to leave about 15-20 minutes later than you would normally expect. Finally, you want to make sure everyone has a ride home, no one got locked out of a car, and that no one is waiting around the building for their ride. Check the bathrooms, other popular areas in the building, and the parking lot. You’re already THIS close to having started the season on the right foot, you don’t want to end up leaving when a kid was around the corner in the dark waiting for their dad (who got held up at work and was 30 minutes late). Also, it’s best if you have another coach with you if you have to wait with a player. So if you’re heading out and a player still is waiting on a ride, just set the expectation that at least two coaches will stay and wait until the kid is picked up. So there you go, ten tips for running a great first practice of the new season! Whether you coach club volleyball or school volleyball, you can use these tips with your new team. If you want more coaching tips delivered to your inbox on occasion, go ahead and sign up for the Get The Pancake Newsletter! And don’t forget to check us out on social! @getthepancake on Facebook, Instagram, YouTube, and Pinterest!